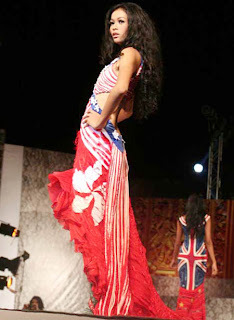 This the one way to unify all countries around the world through designing dresses by using flag style. How it can be? Yups ... 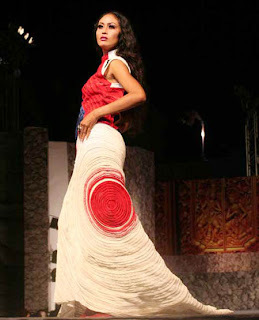 This designer who born on Sumatra, 22 June 1952, Lalea Mardiana Ika, a woman designer from Indonesia had done it and shown her design in Bali Fashion Week, in Garuda Wisnu Kencana, Bali, on August 2008. These creative design was inspired from olympic game, who was established in Beijing, China, that can unify many athletes and people from all around the world to join and enjoy one event in one place. 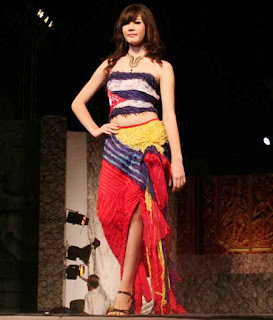 So then, Mardiana Ika created a design theme for her fashion design called 'FLAG STORY". That's why the beautiful gowns of Mardiana Ika has flag motives, such as Japan, England, United State of America, Brazil, Indonesia, etc. The model of the gown were so various, such as Helter Style, Tube Dress, and so on. Here are several of the "flag story" gowns by Mardiana Ika. Her name 'IKA' means “a thousand islands united as one”. 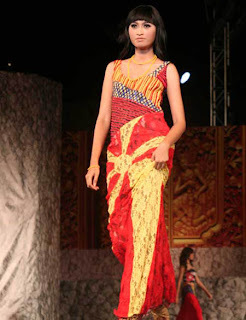 Her designs allow others to get a glimpse of the rich Indonesian culture and beyond. Indonesia-born, Hong Kong based fashion designer Ika, treats designing as a serious issue. She realized very early in her career that there is no alternative to hard work, while design is subjective to the viewer. Having reconciled to this, she discovered that there are successive layers of inspiration in creating a collection, thinking of herself as a spectator in the imaginary world. She describes her work as the most beautiful and exciting aspect of her world. The emerging creativity and experimentation takes her to new heights of elaborate detailing and finishes by having lots of fun! The ultimate challenge is to take design to an elevated level, to keep stimulated and to complete the mindset in the world of realization by involving challenging new technical embroideries and handworks. Her biocultural existences have been a big influence because it opened her mind up to so many different ways of life. Evolving from the Indonesian culture, she has always wanted to explore the unknown streets of other cultures. Because of this, Ika is inspired by modern women who lead active busy lives, people in general with strong personalities that love life and nature. Ika claims that the success of her company is due to the great team work, unusual designs that differ from the current trend, and adding accessories as final touches to the finishing of a garment. It’s an exciting process for her team to work in the Butoni 'fashion kitchen'. Since 2003, Butoni has grown tremendously. With her partner, John Keilman (from Holland), they work with scores of talented staff covering 3 floors, satisfying clients from all over the world. The range now includes a men’s wear collection, with the increasing demands for more designs.